Who’s ready for Canadian National Conference 2016?! Cydcor is excited to get things started with a photo contest where you could win $200 cash! All you have to do to enter is post a photo using the hashtag #Gone2NatCon on Instagram, Twitter, or Facebook anytime from Friday, August 5th (6:00 AM EDT) through Saturday, August 6th at 8:50 PM EDT. You will automatically be entered into the contest for a chance to win $200 cash awarded on site! Don’t miss out in participating in the Canadian National Conference photo contest; it could be your chance to shine! 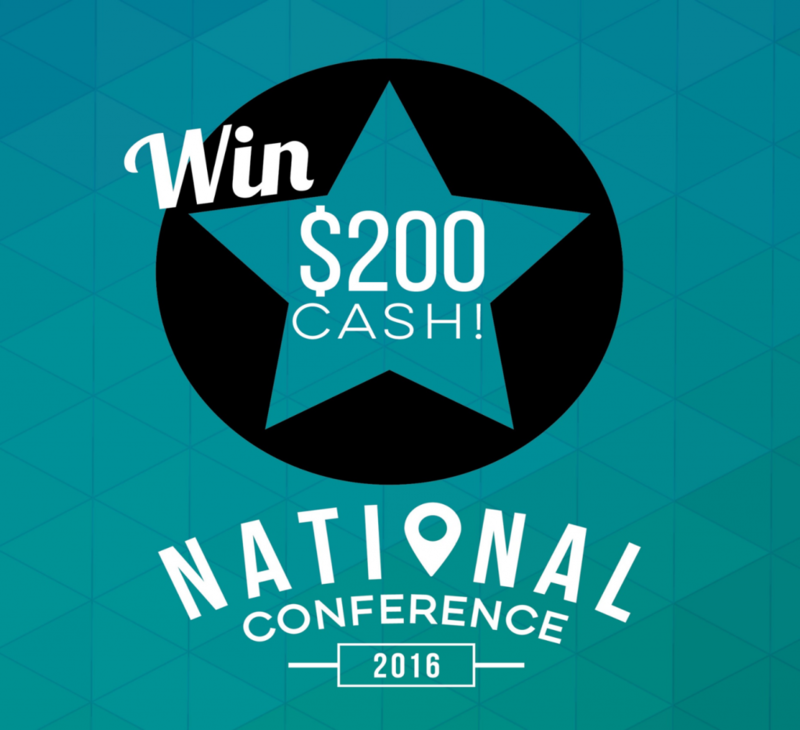 Post a photo on Instagram, Twitter, or Facebook using the hashtag #gone2natcon anytime from Friday August 5th (6:00AM EDT) until Saturday, August 6th (8:50 PM EDT) and you will be automatically entered in the Canadian National Conference photo contest for a chance to win $200 cash awarded on site. To be eligible, entrants must be (i) at least 18 years of age and (ii) a member or affiliate of a Cydcor independent corporate licensee attending the event (Cydcor employees not eligible). Multiple submissions per participant are allowed. Profanity or inappropriate language or images, as determined by Cydcor, in its sole discretion, will be disqualified. There will be one winner selected by Cydcor, in its sole discretion, and announced via Cydcor’s Facebook Page (https://www.facebook.com/CydcorLLC?ref=hl) as well as on Cydcor’s Instagram (@Cydcor), and on Cydcor’s Twitter (@Cydcor) on Saturday, August 6th any time after 9:00PM EDT and no later than 11:59 PM EDT. This promotional offer is not intended to create a partnership, joint venture, co-ownership or other association between Cydcor and the participant. This promotion does not have a connection with Facebook in any way and is not sponsored, endorsed or administered by, or associated with, Facebook. By entering the contest, participants agree to fully release Facebook from any and all liability. Post a photo on Instagram, Twitter, or Facebook using the hashtag #gone2natcon anytime from Friday August 5th (6:00AM EDT) until Saturday, August 6th (8:50 PM EDT) and you will be automatically entered in the Canadian National Conference photo contest for a chance to win $200 cash awarded on site. To be eligible, entrants must be (i) at least 18 years of age and (ii) a member or affiliate of a Cydcor independent corporate licensee attending the event (Cydcor employees not eligible). Multiple submissions per participant are allowed. Profanity or inappropriate language or images, as determined by Cydcor, in its sole discretion, will be disqualified. There will be one winner selected by Cydcor, in its sole discretion, and announced via Cydcor’s Facebook Page (https://www.facebook.com/CydcorLLC?ref=hl) as well as on Cydcor’s Instagram (@Cydcor), and on Cydcor’s Twitter (@Cydcor on) on Saturday, August 6th any time after 9:00PM EDT and no later than 11:59 PM EDT. This promotional offer is not intended to create a partnership, joint venture, co-ownership or other association between Cydcor and the participant. Post a photo on Instagram, Twitter, or Facebook using the hashtag #gone2natcon anytime from Friday August 5th (6:00AM EDT) until Saturday, August 6th (8:50 PM EDT) and you will be automatically entered in the Canadian National Conference photo contest for a chance to win $200 cash awarded on site. To be eligible, entrants must be (i) at least 18 years of age and (ii) a member or affiliate of a Cydcor independent corporate licensee attending the event (Cydcor employees not eligible). Participant may not create multiple accounts to enter the contest – the creation of multiple accounts will make participant liable to have all accounts suspended by Twitter. Any participant found creating multiple accounts to enter the contest will also be disqualified. Multiple submissions per participant are allowed; provided, however, that the participant posts a different tweet each time. Participants may not post the same tweet repeatedly (no duplicate tweets). Posting duplicate tweets is a violation of Twitter Rules and jeopardizes search quality. Profanity or inappropriate language or images, as determined by Cydcor, in its sole discretion, will be disqualified. The winner will be selected by Cydcor, in its sole discretion, and announced via Cydcor’s Facebook Page (https://www.facebook.com/CydcorLLC?ref=hl) as well as on Cydcor’s Instagram (@Cydcor), and on Cydcor’s Twitter (@Cydcor) on Saturday, August 6th any time after 9:00PM EDT and no later than 11:59 PM EDT. This promotional offer is not intended to create a partnership, joint venture, co-ownership or other association between Cydcor and the participant. This promotion does not have a connection with Twitter in any way and is not sponsored, endorsed or administered by, or associated with, Twitter. By entering the contest, participants agree to fully release Twitter from any and all liability, and agree to read and abide by Twitter’s Rules.